There are so many pet friendly hotels in Nashville where pets are more than welcome, planning your trip easy. Pet guests of Loews Vanderbilt Hotel are pampered with five-star treatment. Cats and dogs enjoy yummy menus prepared by the hotel’s award-winning master chef. Pet owners receive posh pet beds, pooper scoopers, litter boxes, collars, leashes and treats. Cats will especially enjoy the scratch poles and catnip. There are even dog-walking routes just outside the hotel for leisurely strolls. 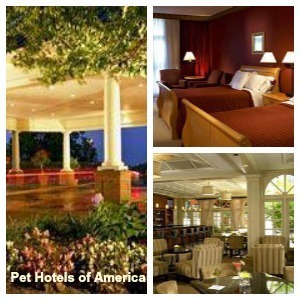 If you are busy, this fine hotel also provides pet sitting and pet walking services. Hilton is another hotel to consider. Unlike most hotels that have a weight limit of 25-40 lbs., the Hilton allows pets up to 75 pounds. Pets are provided with cozy beds and food and water bowls. The Sheraton Music City Hotel is another fine pet-friendly hotel that allows dogs up to 80 pounds, and cats also are allowed. In addition to the many pet friendly hotels in Nashville, there are a lot of places where you can take your furry friend and they are all listed on our Nashville Travel Guide. The Bi-Centennial Mall State Park has acres of picturesque trails where leashed pets are permitted. There are also horse and carriage rides along Broadway and 1st Street where pets can hop aboard for a city tour. For some spooky fun, take a Nashville ghost tour with professional and costumed guides that will recount all the historical spooky happenings in the city. Well-behaved pets are always welcome. Popular dog parks include Shelby Dog Park and Edwin Warner Dog Park. These are off-leash dog parks that are fenced in. Each dog park is equipped with doggie poop bags, water fountains and comfortable benches for pet owners. They are the picture-perfect places for pets to cut loose with their canine friends. After so much outdoor, you surely will be ready for a bite to eat with your best buddy. Enjoy some great coffee and home-baked goods at Fido’s Bongo Java. At the Village Pub Beer Garden, you can grab some local fare with a handcrafted ale on the outside patio with your pet. Beyond the Edge and Ugly Mugs are also pet-friendly restaurants. With so many pet friendly hotels in Nashville along with many pet-friendly venues, Nashville is the ideal destination when you want to bring Fido along.